A company's culture counts more than ever these days. The chain that runs landmark Canadian hotels like the Chateau Frontenac and the Fairmont Banff Springs has been ranked Canada's best place to work, in a new survey from job site Indeed. Fairmont Hotels and Resorts came out on top in a survey that ranked employers based on five categories: work-life balance; salary and benefits; job security and advancement; and management and culture. Fairmont Hotels and Resorts, which runs iconic sites like the Fairmont Chateau Frontenac in Quebec City, has been named the best place to work in Canada by job search site Indeed. Fairmont, which has been owned by French hotel giant AccorHotels since 2016, excels on corporate culture, said Jodi Kasten, managing director at Indeed Canada. It's a place where you can "start in an entry level position and move up through the ranks" — a rarity these days in many workplaces. 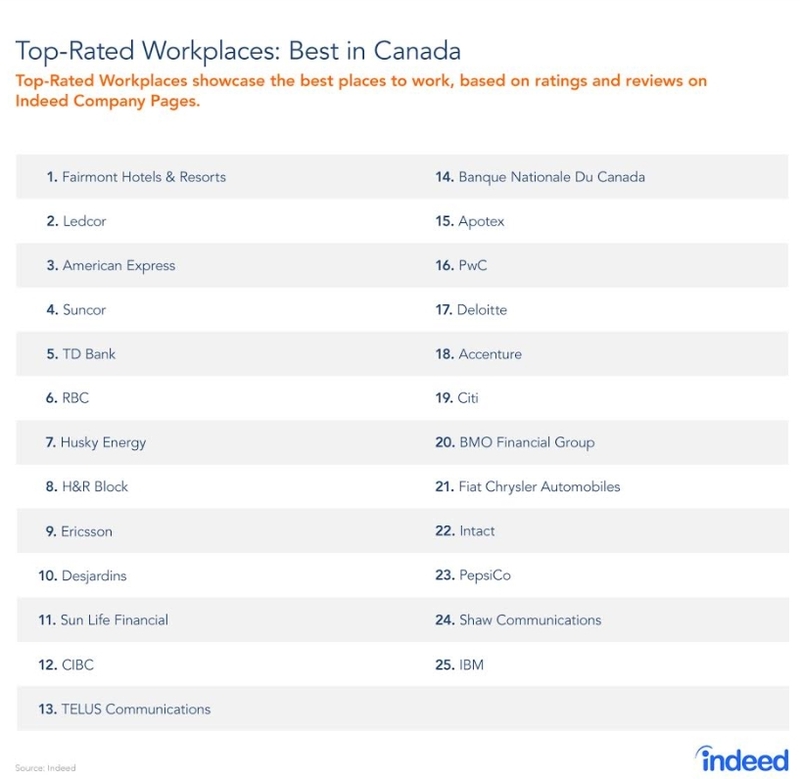 "It was an environment where people felt comfortable and where they felt embraced," Kasten told HuffPost Canada by phone, adding that, to an extent, the same is true of all the 25 top companies on Indeed's list. In second place is B.C.-based construction firm Ledcor, followed by credit card giant American Express in third. Canadian banks and financial services firms also ranked highly on the list, with five of Canada's largest banks making the top 25 (Scotiabank didn't make the cut). "What they do well is a combination of all categories," Kasten said. "They do paid benefits really well, offer a work-life balance, they take into account commuting times and opportunities to work from home, there's a path for advancement, and they get the culture piece as well. They really think about what it means to have an inclusive environment." These days, with Canada's job market so tight there is a record 400,000 unfilled vacancies across the country, a company's culture counts for more, Kasten says. "This is the one piece that might be the defining factor whether I want to work for your company or another company," she said, noting that an earlier Indeed survey found that 92 per cent of Canadians consider an employer's reputation important when considering a job opportunity. Employers can step up their game by offering summer parties or extracurricular activities, as well as by offering courses around soft skills or employees' job functions, Kasten suggested. But "it's also atmosphere," she noted — "the ability to give feedback openly without any kinds of retaliation. Companies that score well on culture often ask for feedback from employees. If you don't get the feedback, how can you improve on anything?" To determine the rankings, Indeed looked at 600,000 company reviews on its website, and narrowed down the list to companies that had 50 or more reviews on the site, essentially limiting the list to larger businesses. CORRECTION: An earlier version of this story stated that Fairmont Hotels and Resorts owns Chateau Frontenac; in fact, Fairmont operates and manages the property. Ivanhoé Cambridge is the owner of the Chateau Frontenac.